All Payments Expo 2015 is taking place next week at Caesars Palace in Las Vegas, but is it not too late to register. Save $100 now by using the code XU2848LNKIN | Register here. 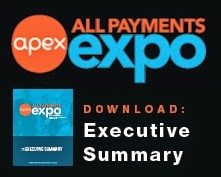 All Payments Expo is the annual meeting place at the intersection of payments innovation, including emerging payments, prepaid, alternative financial services, retail and technology. APEX attracts the highest caliber of payment decision makers. Attendees span every link of the value chain, from merchants to card networks to banks to entrepreneurs - allowing you access to decision makers with several potential partners at once. You do not want to miss this, see you in Las Vegas!